MOURNERS packed a church to pay their respects to cricket legend Keith Barker – with tributes being paid by ex-players from as far away as his native Barbados. The funeral service, held at All Saints Church, Clayton-le Moors, heard tributes from the cricket world, including one from ex-West Indies and Lancashire captain Clive Lloyd. Keith’s wife Val was joined at the service by his children Andrew, Amanda, Gary, Dean, and Keith. A wreath in the shape of a cricket bat adorned his coffin and another mourner carried one which said “Dad”. The Rausings Do Look A Little Zapped, Don’t They? 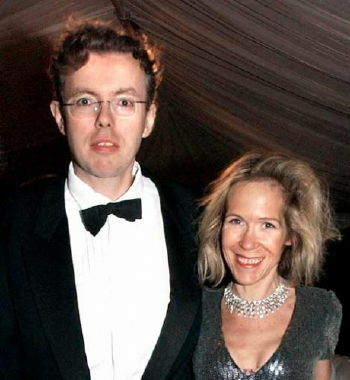 Meet two of the Barbados super-rich: Hans and Eva Rausing. Net worth just over US$11 Billion and owners of the most expensive home on Barbados. And, oh yes, Eva was arrested attempting to smuggle cocaine and heroin into the American Embassy in London. Then Hans was arrested at his home for possession of crack cocaine and heroin. Well… what do you expect from two poor little rich kids who met in a drug rehab clinic? You KNOW what would happen to you or me if we got caught trying to smuggle heroin into the US Embassy. Even money says that these two crack-heads will soon be watching the polo ponies again on Bim. Darling… life is just sooooooo boring, don’t you know? Contrast the self-indulgent behaviour of the Rausings with that of so many of the wealthy folks who come to Barbados and do some good here and around the world. As an example I’m primarily thinking of millionaire philanthropist Peter Allard of the Graeme Hall Nature Sanctuary fame who was sorely abused by the last government. We haven’t heard much about the Nature Sanctuary lately. Perhaps one of our readers can provide an update? Have a read of Ezra’s piece in the Nation News this morning and see if you don’t agree with just about everything he says. David Thompson made very specific promises that got him elected. Now that he has power, nothing has changed. David Thompson promised that a two-thirds majority of the House would be necessary to change land permissions from agriculture – and then he went and gave Sir Charles a free hand to develop agricultural land WITHOUT THE PROMISED TWO THIRDS MAJORITY VOTE. The Nation News: What Change? The current Barbados Government has killed plans for a sugar-based ethanol industry – largely due to revelations by Barbados Free Press that the previous BLP government had covered up secret European Union reports showing that the Arthur-Mottley government’s ethanol plans were technically and economically not viable. We are told that one of the first acts of newly minted Minister of Agriculture Haynesley Benn (photo above) was to ask to see ALL VERSIONS of the European Union sugar reports as first revealed in BFP’s article Secret European Union Reports Slam Barbados Ethanol Plan. It didn’t take the Thompson Government very long to discover that the ethanol plan was a sham – and most likely just another scam to facilitate the transfer of tax revenues to greedy pockets with no appreciable benefit to Barbados and her citizens. For three years as the mainstream Barbados news media jumped on the Arthur-Mottley Government’s cane ethanol bandwagon, a courageous government employee wrestled with the conflict between loyalty to the BLP government and duty to the people of Barbados. This government employee knew that cane ethanol was not viable for Barbados, and that the Arthur-Mottley government was deliberately concealing data and reports so they could justify a course of action that, according to our source, had the primary purpose of lining the pockets of certain very narrow interests. By last August, the government employee decided that he must reveal the truth – but how? In the end he came to Barbados Free Press with his story, and the rest as they say, is history. When the new Agriculture Minister asked to see ALL VERSIONS of the secret European Union reports as mentioned in the Barbados Free Press article, that was the end for cane ethanol. Last Sunday we listened to the pathetic squealing of “professional journalists” on Down To Brass Tacks radio show – complaining that the Barbados blogs are destroying newspaper advertising revenues and upsetting the media’s control over what people are allowed to know and talk about publicly. While they were moaning and groaning about constraints faced by “professional journalists”, David over at Barbados Underground was busy interviewing Chief Marketing Manager Stephen Worme of Barbados Light & Power Co Ltd. about future plans for alternative energy sources. Why did Mr. Worme even bother to answer questions asked by one of those despicable (Carl Moore can spit upon de ground here) blogs? Simple… Mr. Worme knows that thousands and thousands of Barbadians read the blogs each day, and that these internet-savvy citizens are a more upscale and thoughtful audience than is reached by the dead-tree editions of the local newspapers. He also knows that on the blogs he has more of a chance to speak directly to the citizens and that probably all of what he says will be printed. The newspapers tend to take a few words and that’s all the public sees, whereas the blogs usually print everything. Smart man, that Mr. Worme. No – She Didn’t Get A Tattoo On Her Face… But How Long Can It Be Until She Does? Yup, the Girl Gone Bad has done it again and added to the tattoo collection that seems to be growing day by day. 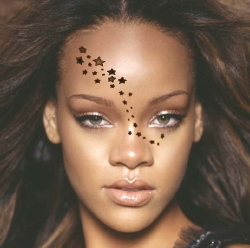 Our resident PhotoShop “Girl Staying Good” – Shona – lifted the new tattoos from one part of Rihanna’s body and put them on her face.